← 230 Fifth – Malaysian Monster Madness!!!! 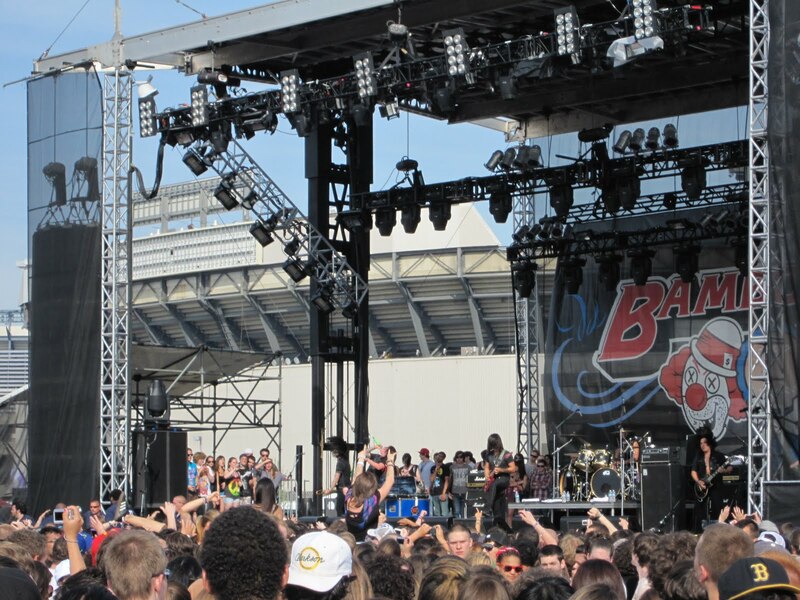 Thank god for VIP passes, seriously. 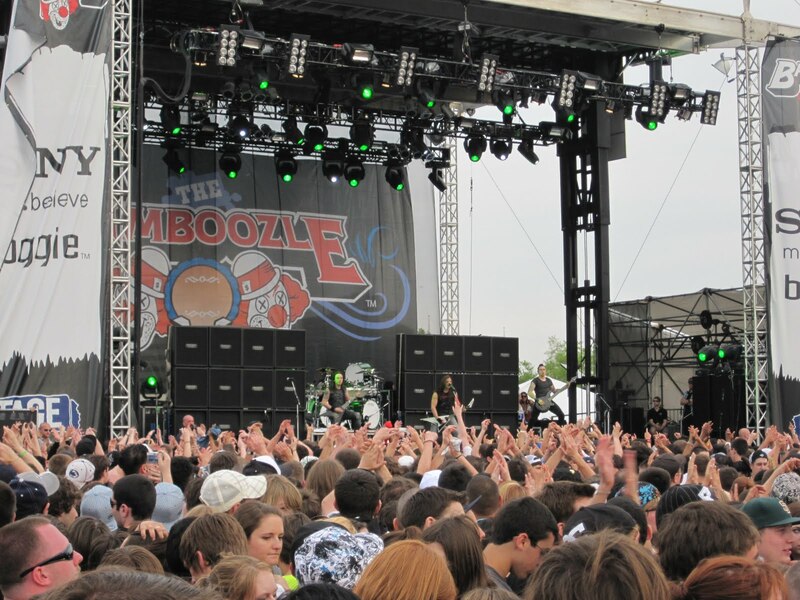 This past Saturday I was standing back stage at The Bamboozle, a massive concert thrown in the parking lot of Giants Stadium and a rumbling began in my tummy. 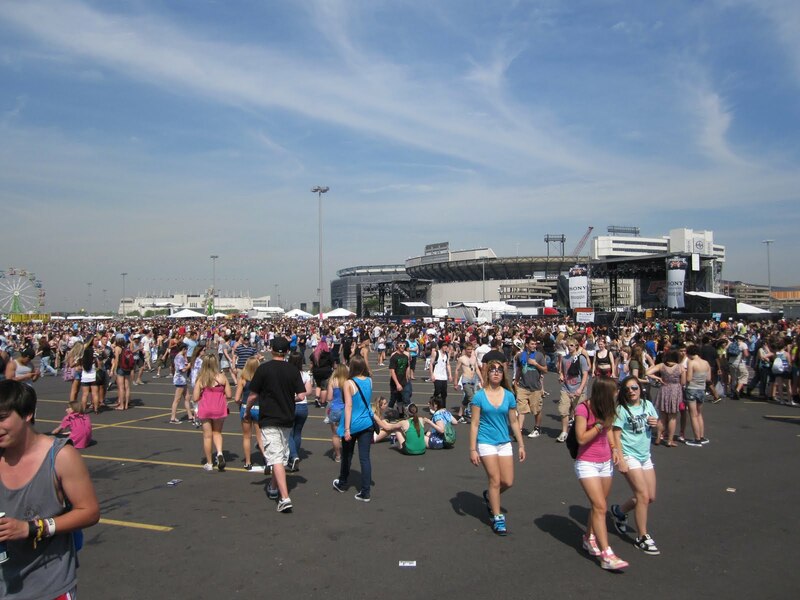 The gates were about to be open and soon 30,000 some crazed music fans would be jamming out to 2 fulls day of music, comedy and other amusements on 8 different stages. 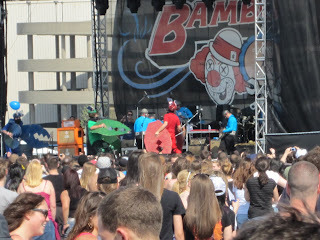 The band given the honor of kicking off the event on the main stage was an act we work with named VersaEmerge. The band hails from Florida and is getting ready to release their debut full length record on Fueled By Ramen Records. I’m not just saying this because we work with them but the new songs are beautifully constructed pieces of rock and roll magic. 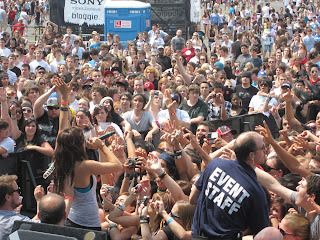 This was going to be the first time a lot of people, including myself and most of their label would see them play some of the new material live. Check out their cover of the Rolling Stones’ “Paint it Black” on the band’s MySpace page. Getting to the point, I didn’t want to miss the band and I knew the minute the gates were opened, every single line for food would be at least 30 minutes. Be it burritos, hot dogs, cookies or sodas, there are just too many people with too few booths to rapidly accommodate the consumption. That’s when the gears began to spin and I am not talking about Scott’s car! 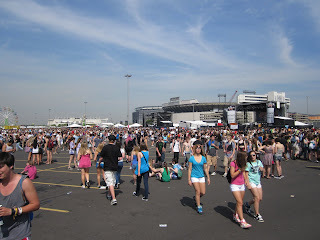 Giant’s Stadium is located in East Rutherford, NJ. 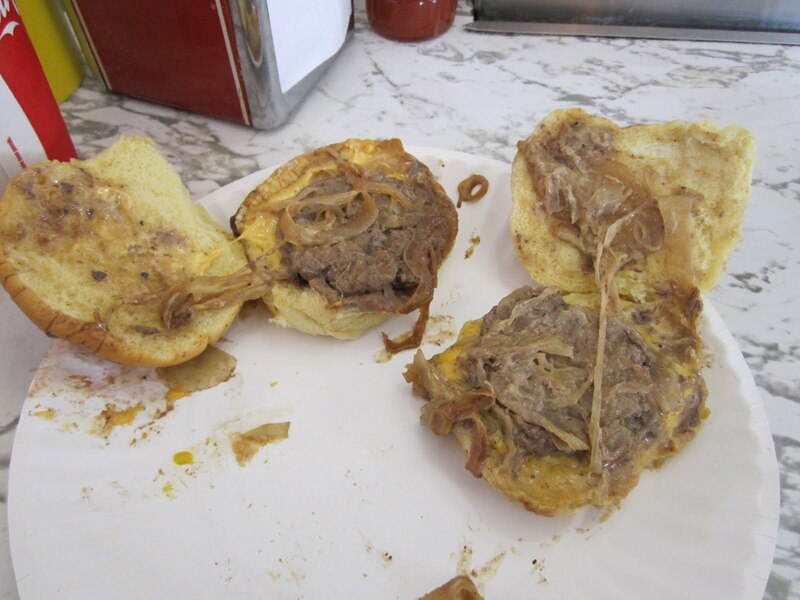 That puts it dead center in the middle of NJ’s biggest burger rivalry…6 miles to the North, the White Manna of Hackensack, NJ and 6 miles to the East, the White Mana of Jersey City. 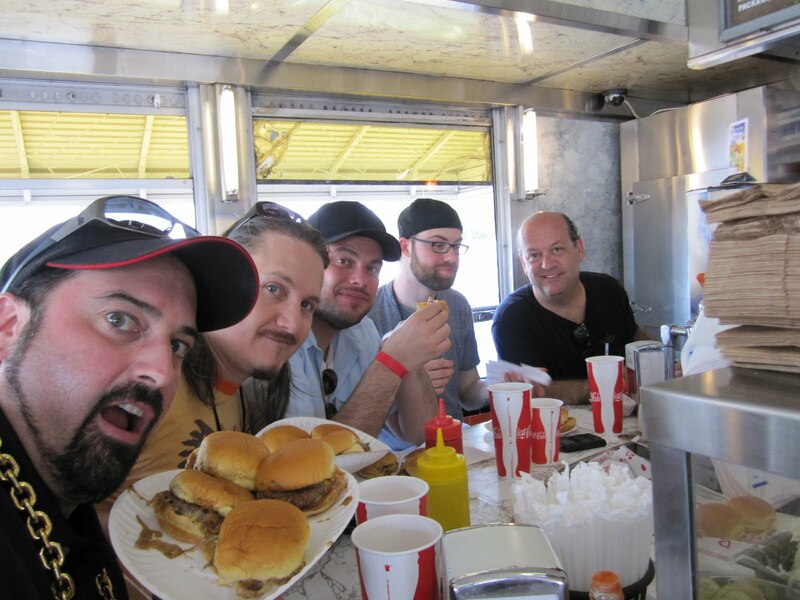 The story goes like this; Louis Bridges opened a burger stand at the 1939 NYC World’s Fair. It was called the “Diner of the Future.” It was a huge hit and after the fair, it was moved to it’s current location on a trucking route on the backside of Jersey City, NJ. 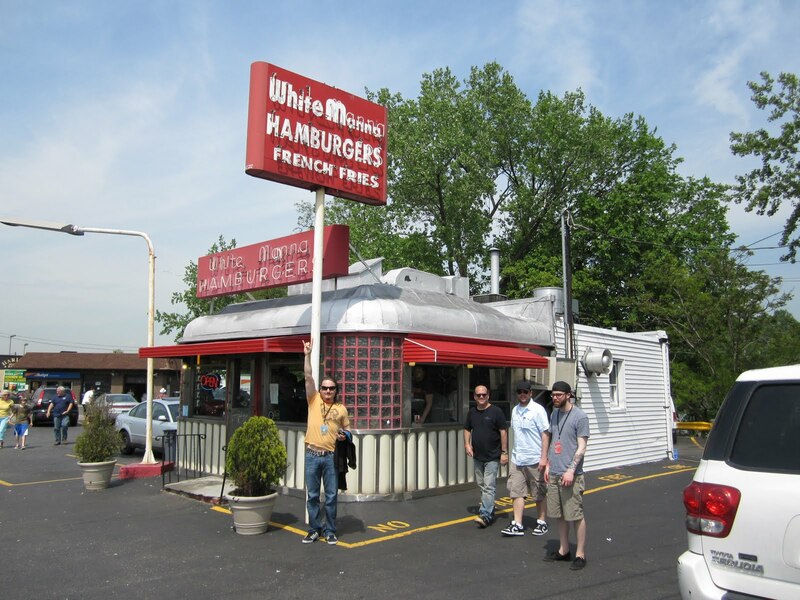 It was then renamed “White Mana.” In 1946 Louis opened another location on the river in Hackensack, NJ. 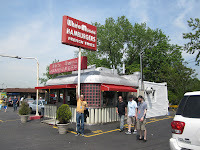 This one was also called by the same name but the company who created the sign spelled it with a 2nd “n” thus creating the “White Manna.” Since then 3 more locations have been opened and also closed with only the JC and Hackensack locations remaining. 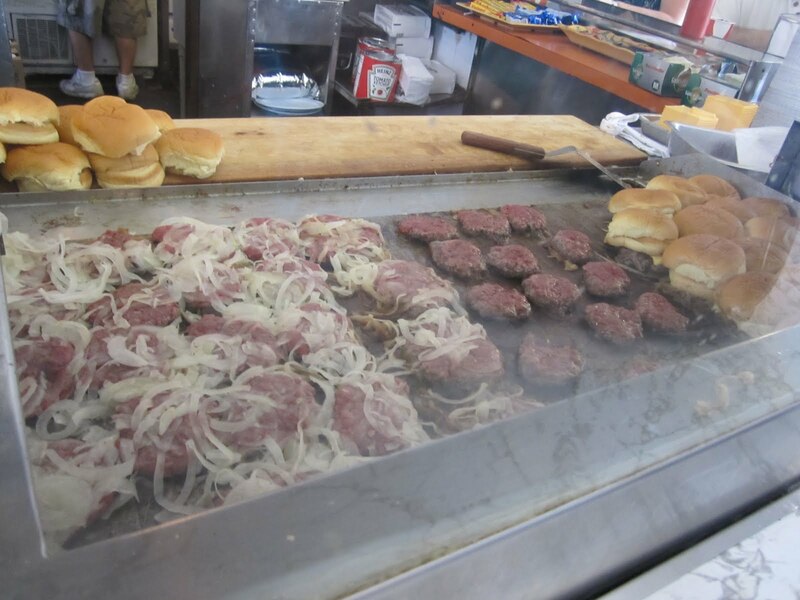 In 1979, Mario Costa Jr. bought the Jersey City location from Bridges’ brother. He then turned and sold the business off in 1996. When Mario found out that the new owners had planned to tear it down and replace it with a popular doughnut chain, he begged them to sell it back. They refused and Mario, so convicted, filed a lawsuit which he unfortunately lost. Eventually the new owners gave in and sold the Mana back to Mario…with a much inflated price tag. In 1997 the restaurant the Jersey City Historic Preservation Committee declared restaurant a local landmark. Mario still owns the spot. Not only is it an amazing piece of history, they make absolutely delicious smashed style sliders and are one of my personal faves. It’s open 24 hours a day and draws quite a unique mix of people throughout the day. You can take a seat at the U-shaped counter, placed around the grill where the chef will take your orders, or you can sit in the adjacent dining room. The vibe is incredible, the story is amazing and most importantly, the burgers are delicious. You can read my full review here. 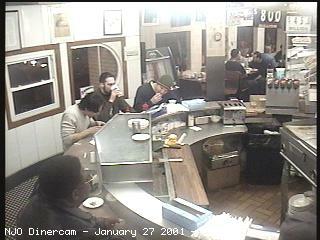 The JC Mana used to have a webcam known as the “dinercam” that snapped live photos every few seconds and posted them http://www.nj.com. Unfortunately it doesn’t exist any more but it was definitely a highlight back in the day. 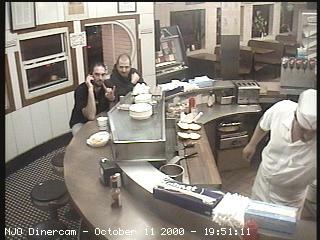 But I have dozens upon dozens of photos I’ve downloaded of me eating there to keep the memory alive. nd my business partner Adam, piled into Scott’s SUV and pointed ourselves towards Hackensack, NJ. Both restaurants are small, short order diners that served smashed style sliders on simple white paper plates but that is where the similarities end. The Hackensack location is much, much smaller with seating for less than 20. Due to it’s small size, it’s not uncommon for the line for burgers to reach out into the parking lot. 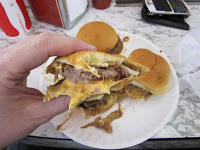 Compared to the Hackensack Manna’s menu of burgers, fries, grilled cheese and steak sandwiches, the Jersey City Mana’s menu feels like an encyclopedia. Let’s line the 2 of ’em up slide to slide. Mon.-Sat., 8:30 a.m. to 9 p.m.; Sun., 10 a.m. to 6 p.m. Even though the place was packed and the line was out the door, we somehow managed to get 5 seats together at the counter. Knowing we had to get back to the concert and seeing how busy the place was, we decided to simplify our order – 2 fries, 5 drinks and 20 cheese burgers (4 each.) 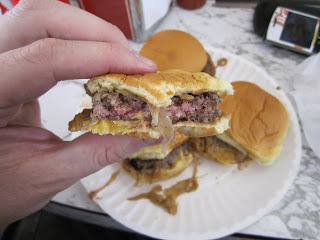 As we sat in our stools watching the grill man flip burger after burger in 3 stages, I could hardly keep myself from drooling. 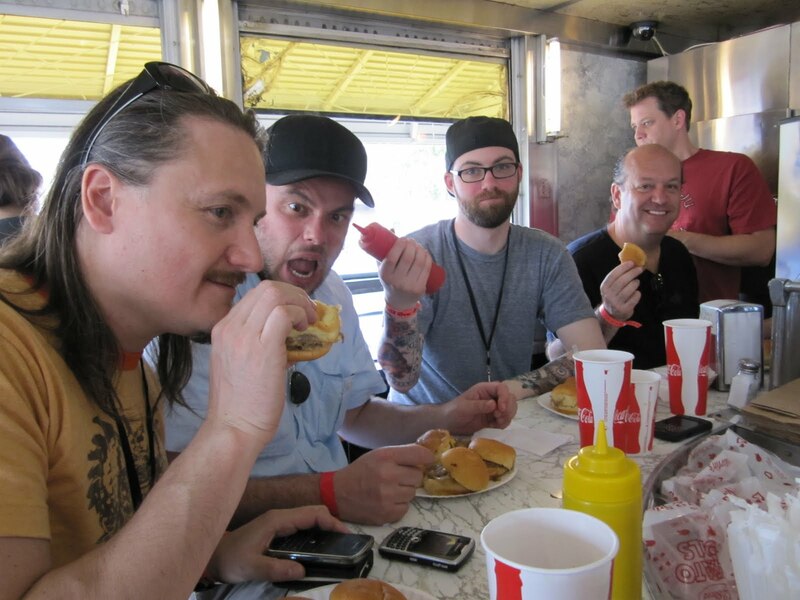 It was clear that I was going to spend the rest of the day, happily, wreaking of cheese burgers. In fact, if you leave the White Manna and you don’t carry the scent with you, start over because you did it wrong. 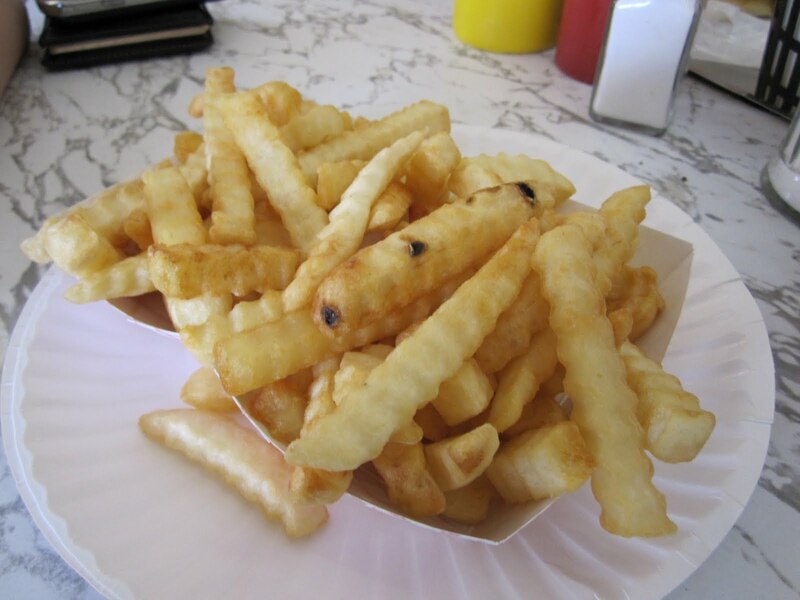 The fries came up first and the mounting hunger in our bellies had us devouring them in a matter of seconds. They were crispy, hot and delicious but nothing really special. Finally the burger moment of truth arrived. The grill man served us each one at a time. I opted to go last and let the others start consuming upon being served. The burgers were hot, steamy and bellowing with an amazing aroma. I couldn’t have been more hungry or anxious by the time I was handed mine. The first one went down in the blink of an eye. I promised myself I would breathe between bites of the rest. 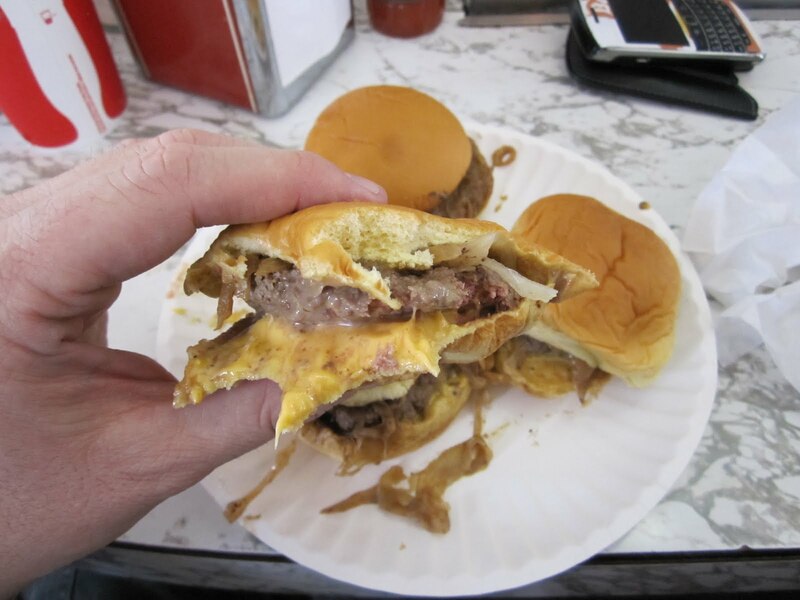 Each burger was just large enough for 1 slice of American cheese folded in half. This made for a much larger cheese to beef ratio than on a normal burger. 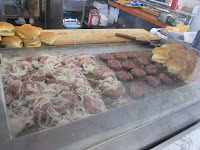 The cooking process steams the cheese and bun leaving a piping hot, squishy, melty, aromatic bite sized burger. They were damn good but I must admit they did need a little spicing up. I added some salt and pepper to my last two and it was the perfect move. The onions were sweet and delicious although I will admit, they could use just a little less of them to achieve the perfect beef to onion ratio. The fresh groudn beef made for a taste sensation that satisfied the whole group. 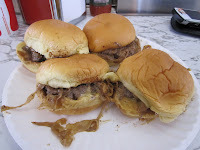 While the sliders were delicious and hit the spot but I must admit, I prefer the Jersey City White Mana! Burger craving and rival curiosity squelched, we made a speedy return to the Bamboozle. 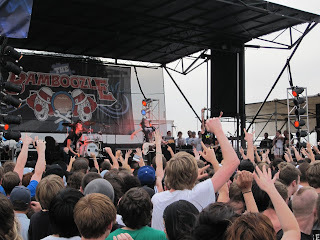 Here are some photographic highlights of of the band’s I enjoyed the most. The Aquabats. 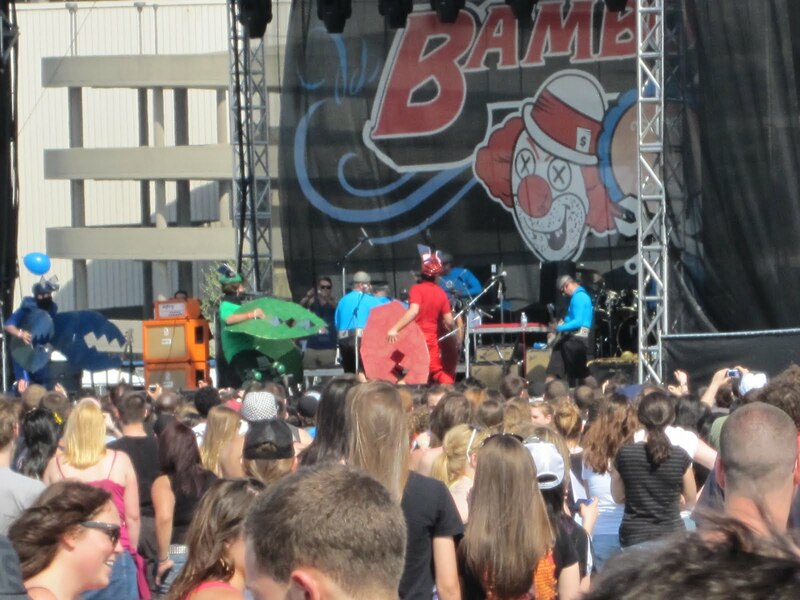 You may be more familiar with them as Yo Gabba Gabba!. 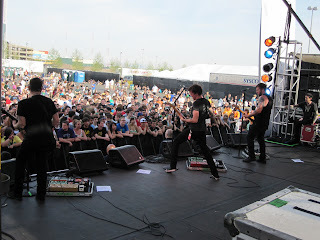 One of the band’s listed on the bill was “Gegen Mich” who turned out to be the surprise guest of the day – Against Me! 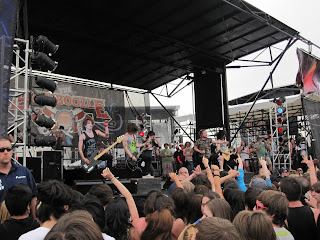 Winners of my personal mosh-tastic award of the day, Asking Alexandria. And the band that sold more records this week than Justin Bieber…Bullet For My Valentine! That is just amazing and they definitely deserve it. This entry was posted in Uncategorized and tagged great burger conquest hamburger cheese review hackensack nj new jersey white manna mana sliders rivaly bamboozle versaemerge asking alexandria we came as romans bullet for my valentine. Bookmark the permalink.